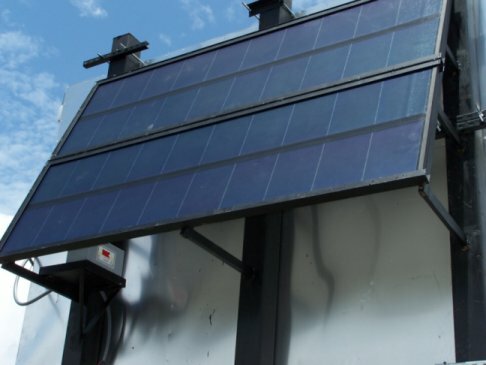 Solar Powered Scoreboard utilizes Triple Junction silicon solar cell composed of three semiconductor junctions stacked on top of each other for diverselight level absorption. The spectrum splitting capability is the key to higher efficiency and superior operation in low light levels. The unbreakable, non-glass module is bonded to an anodized aluminum frame for strength. We have installations around the world and in Central and South America. 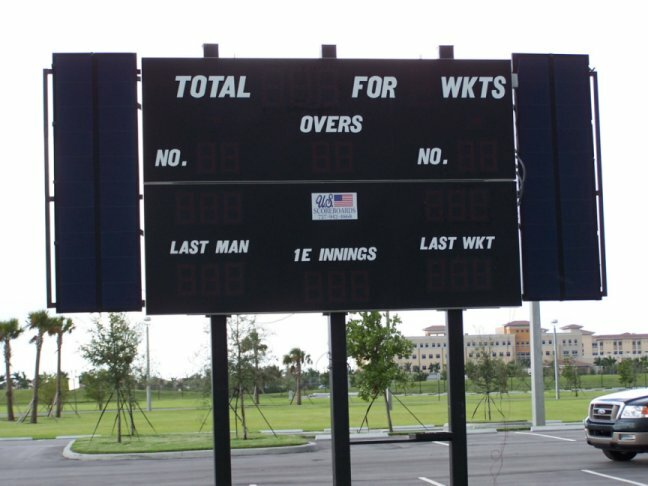 Our RF Wireless CRICKET scoreboards basketball and football, baseball, soccer, hockey, volleyball and swimming scoreboards have many standard features as well as an extended list of available options to make your wireless CRICKET scoreboard as customized as you would like. Custom Designs are FREE. CRICKET scoreboard models and other electronic scoreboards come with our standard RF, radio frequency, wireless scoreboard color controller, no extra wiring to worry about No Extra Cost. When 120 volt power is a problem, choose our battery power scoreboard and wireless controller. We use PDA and PC wireless controllers for ease of use and compactness. Basketball scoreboard software allows for LED displays to come standard with 16 different shades of LED's. Sponsor Panels--CRICKET Scoreboard Sponsor panels may be any size and can added to any side of the scoreboard. Use this advertising option and help pay for your scoreboard. Powder Coating Finish--The finishing touches of our LED scoreboard comes with our unique framing design, and quality powder coating. We can supply special powder coating color for your electronic Cricket scoreboard. Custom logos for the electronic scoreboard model can be made from your artwork or use our expert graphic designers for that custom design. 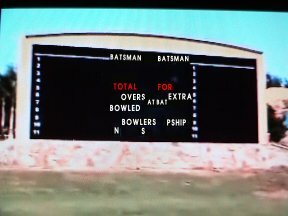 All of our Cricket scoreboard models are made with quality wide angle LED digits, last over 100,000 hours, are inexpensive to power, and easily to seen, even in direct sunlight. Powder coating finishes... Our standard wireless hand held controllers are rugged and easy to use. Our LED Scoreboard system is configured so we just plug and play. Solar Powered Scoreboard - High Tech engineering allows us to use our solar power scoreboard technology to run our solar scoreboards. and when you add wireless communications, makes our scoreboard totally independent on any outside power source.